# 74 in our Waikiki map. 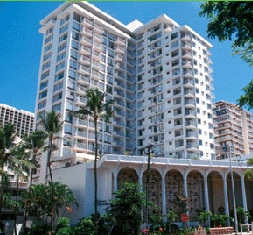 Hotel Name: .... Queen Kapiolani Hotel. Address: ......... 150 Kapahulu Ave. The Queen Kapiolani Hotel was originally built in 1969 at the very end of Waikiki just across the street form the Honolulu Zoo and the Kapiolani Park. It has 19 floors and over 300 rooms, with a fairly large common area including a decent size lobby, shops, restaurant, bar, banquet facilities and pool. 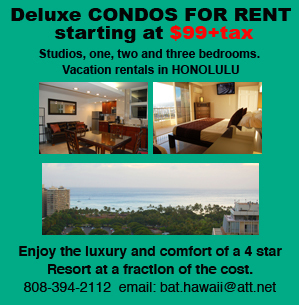 This hotel is number "74" within the yellow zone of our waikiki map, click here to see it's location in relation to other hotels in Waikiki. Most of the rooms have bathtubs. The hotel underwent a recent renovation and the rooms have been improved from the former look. Even though is somewhat far from the center of Waikiki, it is very close to the beach and Kapiolani Park is an excellent public recreation area, particularly if you have kids or if you are fond of green areas and walks. Kapiolani Park is also home of the Honolulu Shell where many concerts take place, the Honolulu Zoo, the Royal Hawaiian Band Stand, archery targets and public tennis courts. This hotel has a mandatory extra daily "Hospitality fee", that is not included in your room total until you check out. These fees, also known as "resort fees" or "amenities fees", are being charged in several area hotels and range from $10 to $40 extra per day. This hotel has changed hands recently and the new owners have renovated the rooms. It is still a very old hotel and the original older construction design is evident but at least it looks better than before. Even though about 80% of the rooms have balconies, these are very small. You may want to stay away from lower rate rooms, most have no balconies and are VERY small, particularly those with room numbers ending in 21. There is a lively gay bar called "Hulas" on the second floor of the building next to this hotel fronting most of the Ocean Views and partial ocean view rooms. This bar is open to the outside and noise can be a problem since it remains open every day until 2 am. This hotel is one of the 10 pick up points that most tour companies use to pick up customers in waikiki so is not uncommon to have buses parked in front of the hotel with the engines running for extended periods of time. Since the lobby is about 6 feet higher than the sidewalk you will need to negotiate either a ramp or several steps what may represent a problem if anybody in your party has mobility problems.